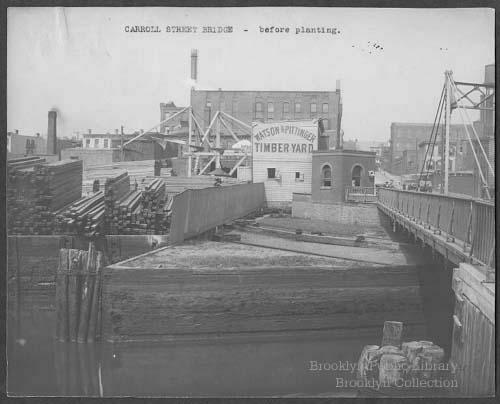 Grass plot adjacent to Carroll Street Bridge at Gowanus Canal; tracks and wires bisecting grass plot; portion of bridge at right; street with automobiles, pedestrians, and buildings receeding into right background; piled lumber behind wooden fence at left; pilings in canal in right and left foreground; wooden building with painted sign, "Watson & Pittinger Timber Yard," beyond grass plot; factory, smokestacks and water tower in background. The photo below is, naturally, "Carroll Street Bridge After Planting." 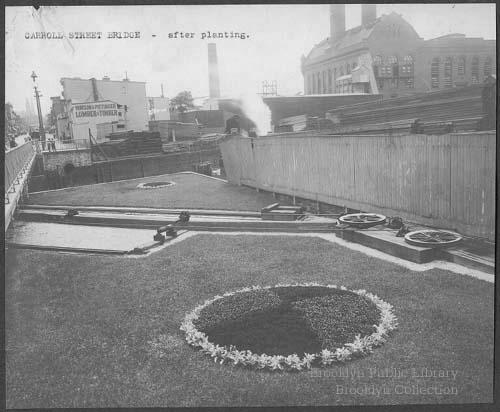 Grass plot adjacent to Carroll Street Bridge at Gowanus Canal; wires, pulleys, and tracks bisecting grass plot, with circular flower beds on either side of tracks; side of bridge at left; wooden fence at right; portion of canal between railing and fence; piled lumber and factory with two smokestacks in right background; street with automobiles, pedestrians, and lampposts receeding into left background; wooden building with sign, "Watson & Pittinger Lumber & Timber" beyond canal.Typed caption on verso: "Carroll Street Bridge -- Carroll Street Bridge is one of the oldest bridges in Brooklyn. It was built in 1889. A new motor and brakes were added to it in 1957. This is how it looked in 1912." The area is no longer planted. If you're familiar with this view today, you'll note the old power plant in the background, part of which is still standing.